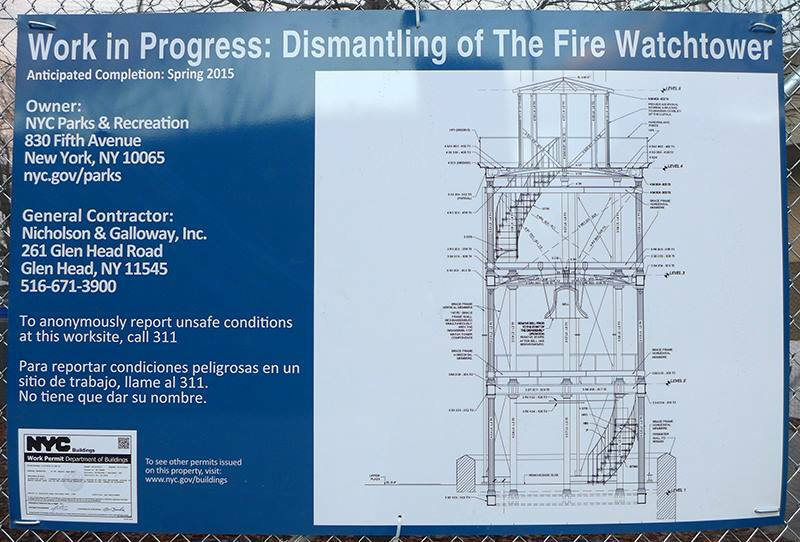 The restoration of the fire watchtower is just beginning. During the first week of December 2014 construction fencing was installed to surround the areas where work will take place including access roads that lead up to the acropolis. During phase one of the restoration the tower will be dismantled. Each piece will be labeled and crated before being moved to storage in Fort Totten (Queens). The 6 month contract to do this work was awarded to Nicholson & Galloway with Allen Architectural Metals consulting. On December 26, 2014 Lynn Lieberman noticed that workers were installing scaffolding around the tower from her balcony on Madison Avenue. 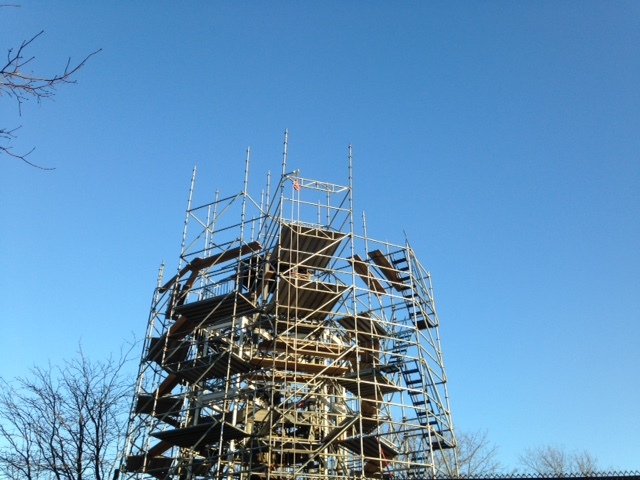 December 26, 2014 Scaffolding begins go up around the fire watchtower. Dismantling of the tower is expected to be complete by April 2015. At this time revised construction drawings prepared by engineering firm Thornton Tomasetti will be presented to the Landmarks Preservation Commission, The State Office of Historic Preservation, Community Board 11 and to Community Stakeholders. Approved Construction Drawings will then be submitted for construction bids for phase 2 of the project which is the restoration and re-installation phase. Phase 2 is expected to begin in the Spring of 2016 and the re-installation of the tower is expected to be complete by July of 2017. 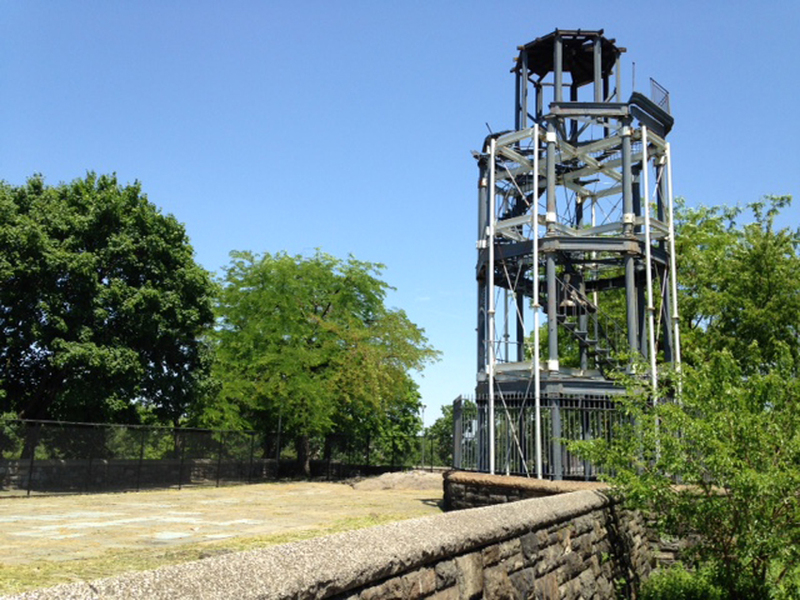 The fire watchtower sits atop of Mount Morris in Marcus Garvey Park on what is known as the acropolis which is a series of WPA built terraces. The acropolis went through a period of disuse after the benches had been removed and the area was left vulnerable to criminal activity. In recent years as the acropolis became a destination for tourists and new residents in the community the area has become safer. The Acropolis will also be restored and reactivated as a public space to be used by community residents and tourists from around the world. This photo was taken by one of the workers from the top of the scaffolding surrounding the fire watchtower. The view is of the north terrace of the acropolis with the shadow of the tower surrounded by scaffolding. 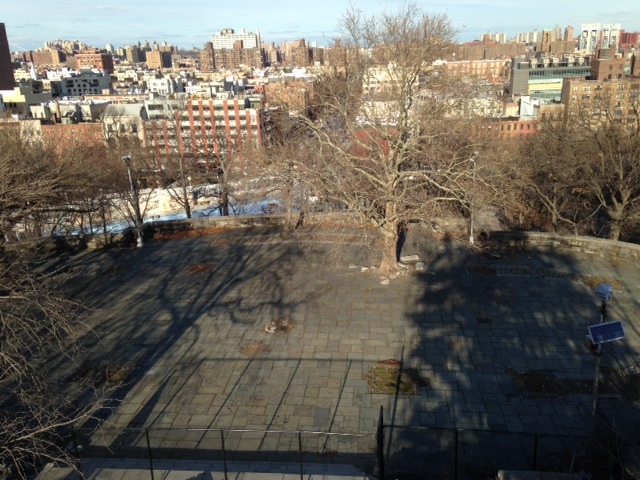 The pool is to the left a little ways down the mountain with Fifth Avenue north of Marcus Garvey Park running through the center of the image. 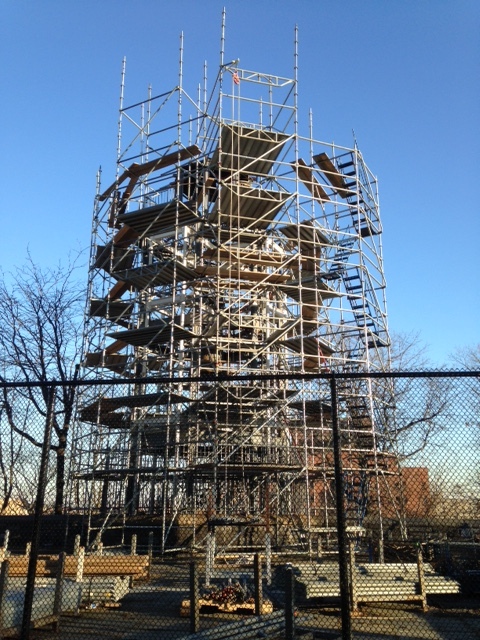 The Fire Watchtower Facebook Page and the Marcus Garvey Park Alliance Facebook Page are updated regularly with information about the restoration of the Fire Watchtower and the Acropolis. Special thanks to Lynn Lieberman (who has a view of the Acropolis from her balcony) and Cynthia M. Reed for their images and updates. 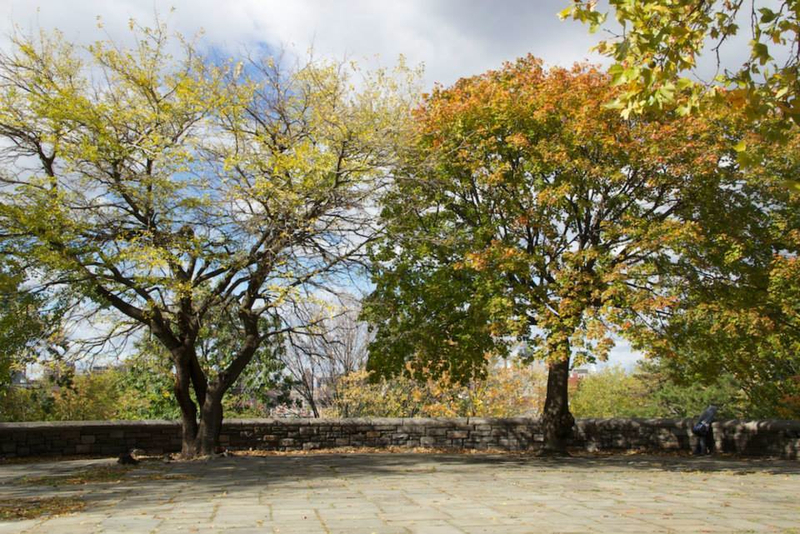 Stay tuned for dates of community visioning sessions where you can share your ideas about the redesign of the Acropolis. 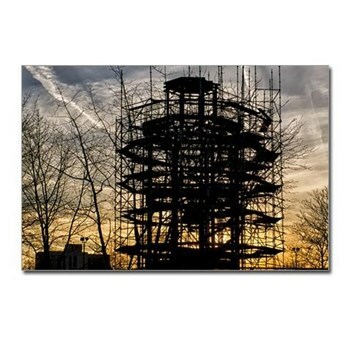 Sunset over the Fire Watchtower and the Acropolis post cards $8.99 a package of eight. 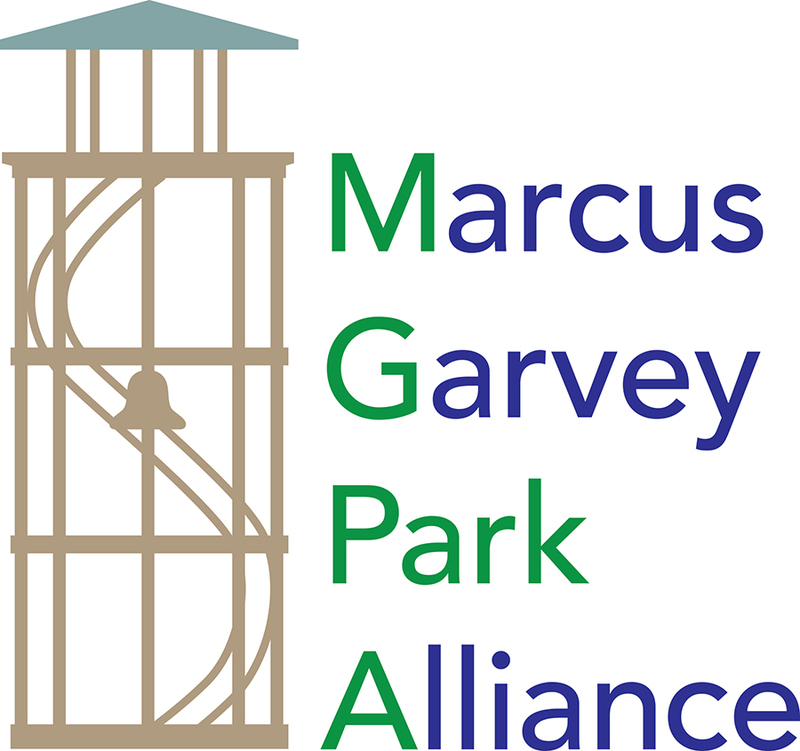 50% of the proceeds from the sale of these cards and other Marcus Garvey Park items will go to the restoration of the acropolis. Available at A Life of Cyn on Cafe Press. All photos for this merchandise were taken by Cynthia M. Reed.